This article is about Champagne bottle sizes, but first a little background on Champagne. Champagne is a sparkling wine produced exclusively from grapes grown in a specific region of France. Other sparkling wines may be produced the same way but only the sparkling wine produced from grapes grown in the Champagne region are allowed to be called Champagne. 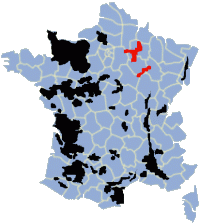 In the France map below, wine regions are shown in black, and the red regions are the only locations from which “Champagne” can be created. The fizz that champagne is so well known for is produce by a secondary fermentation. 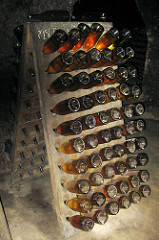 The Méthode Champenoise is the traditional method by which Champagne is produced. After primary fermentation and bottling, a second alcoholic fermentation occurs in the bottle. This second fermentation is induced by adding several grams of yeast Saccharomyces cerevisiae and rock sugar to the bottle. It is then sealed with a temporary metal cap, like a beer bottle. The secondary fermentation produces carbon dioxide, which is trapped in the wine, under pressure. In order for the complex flavors of the champagne to develop, the dead yeast (called lees) from the secondary fermentation is left in the bottle for a couple of years to interact with the wine. The champagne matures in the bottle it was fermented in, and these bottles are stored in racks, underground, initially approximately 45° inverted. Every few days, someone (or now a machine) gives each bottle a slight turn and slowly increases the inclination of the bottle until it ends up totally inverted. This twisting (called riddling) is designed to shuffle all the lee residue into the neck of the bottle where it can be removed. The problem? How do you remove the lees without releasing the fizz in the champagne? The solution is to freeze it. The necks of the inverted bottles are immersed in a frigid brine solution, cold enough to freeze the liquid and sediment in the neck. Then, when the temporary cap is removed, the pressure of the wine forces the plug out. 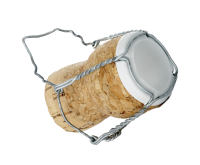 The bottle is then topped up to full capacity, and the well-known champagne cork, wire basket, and foil wrapping are added. A standard bottle of Champagne contains 75 cl of wine. Different producers have different styles of bottle, but all standard bottles hold approximately the same volume of liquid. Bigger, and smaller, bottles of Champagne are also sold. A common size is a Magnum which contains the equivalent of two standard bottles. Of course this does not mean a magnum bottle is twice the height of standard bottle. That would be crazy! If you scale a shape up a by a scaling factor, it’s volume scales by the cube of that ratio (and its cross sectional area by the square of the ratio). If we doubled the size of a standard bottle of champagne by doubling all the dimensions, we’d end up with a bottle than contains eight times the volume of wine. The picture on the left shows how this looks with a simple cube. To double the volume of wine we need to scale up each dimension by the scale factor 3√2 ≈ 1.26x The picture below shows a more accurate representation of scaling the volume up by a factor of two. A Magnum bottle of champage is only approximately 25% taller than a regular bottle of Champagne. 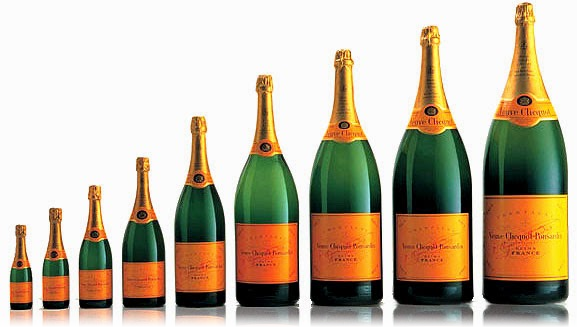 There are many other different sizes of bottles, below is a picture of their approximate relative sizes. These bottles are not direct scale factors, and have vaguely similar shapes, but issues such as glass thickness, and more importantly cork size, do not scale in the same proportions. Piccolo means "small" in Italian. Demi means "half" in French. Jereboam was the First King of the Northern Kingdom of Israel. Rehoboam was the First King of Judea. Salmanazar was King of Assyria. Balthazar was one of the Three Wise Men who presented gifts at Jesus' nativity. 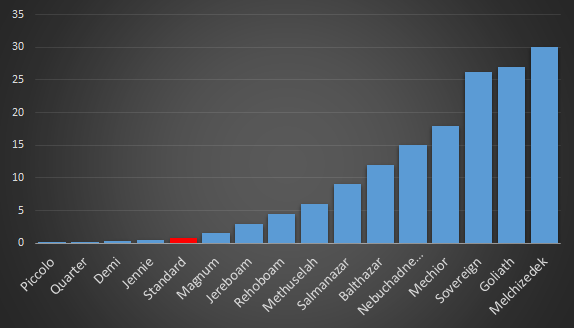 Nebuchadnezzar was King of Babylon. Melchior was another of the Three Wise Men. Solomon was King of Israel. Son of David. Goliath was the giant killed by David with his sling and a stone. The fact that length, cross-sectional area, and volume change by different amounts as things are scaled is a mathematical principle that occurs frequently in many forms of science. It’s often given the name of the Square-cube Law. In architecture, as buildings get taller, the weight of the building material increases with the cube of the scaling factor. However, the load bearing cross-sectional area of the structure (which this weight must be supported by), only increases with the square of the scale factor. This limits the ultimate height a building can be made. In biology, a similar principle applies to the height of which an animal can become and still have its bones support it. In addition, it’s hard for a larger animal to keep cool as the surface area grows only with the square of scale, whilst its volume increases with the cube. Heat is generated by the body, and this excess heat is radiated by the skin. For the same reason, science-fiction movies involving giant robots, aliens, and lizards are just that, fiction. At the other end of the scale, however, it means that ants can carry hundreds of times their own body weight. This leads to a philosophical question: Which is stronger, an Elephant or an ant? An elephant can lift over half a ton which, whilst impressive, is only 10% of its body weight. An ant can only lift a millionth as much weight, but this corresponds to 50 times its own body weight. Returning to Champagne, we've all seen videos of Grand-Prix winners shaking bottles and spraying others with bottles of champagne. Whilst traditional, it's a little crass and wasteful. Want to be cool? Why not open your next bottle with a sabre? It looks impressive, but it's not that hard to do. 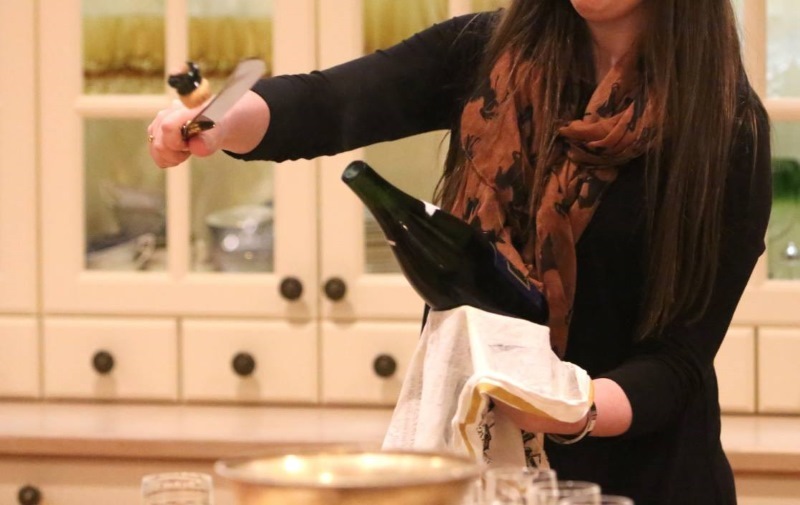 The Champagne in the bottle is already under quite a bit of pressure, and a sharp impact with with an object under the lip of the bottle (where there is already a concentration of stress) is enough to cause a crack to rapidly propogate around the neck, taking the cork, still attached to the top of the bottle, away. Advice is to find the natural vertical seam of the bottle (from when it was manufactured), and slide the blade along this to the lip (this seam provides an additional second order region of weakness). Using a sabre is a ceremonial way of opening a bottle, but the impact does not need to be with s sharp blade; it's the momentum that is needed, not the stress concentration. In fact, it's better to use the square or dull edge of the blade; this preserves the cutting edge, makes it easier to hit the lip square on, and also provides a degree of safety if you miss! It also doesn't even have to be a sword or knife. I've even seen it done with a spoon!